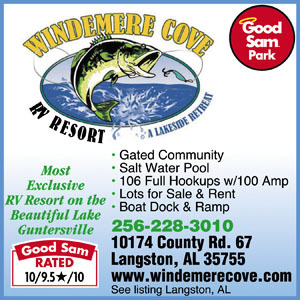 ENJOY A LAKEFRONT RV GETAWAY! Our Lakeside Retreat has the best nature has to offer...fishing, boating, kayaking & breathtaking lake views. 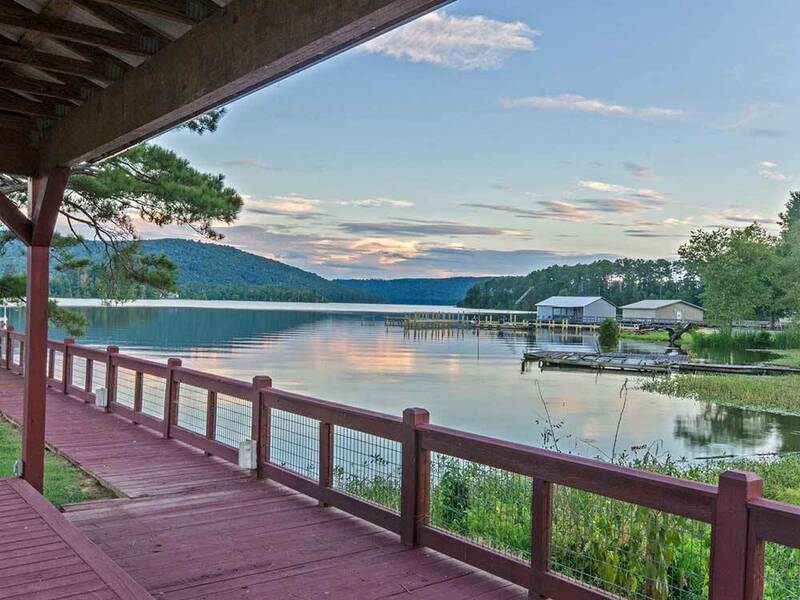 Located on the beautiful shores of scenic Lake Guntersville, just a short distance to numerous places of interest. Husband & I made a quick trip from the Atlanta metro area. We looked at their website to confirm driving directions and it's important that you pay attention to their note about using the address they provide for GPS purposes. We had no problem finding the campground with their instructions. We have a 40ft rig and also had car and golf cart on trailer. They gave us a pull thru which was great. There is a secure parking area to store trailers, boats, golf carts, etc. The concrete lot was very nice and long. Property very well maintained. Very friendly folks. Well lit at night in the area we stayed. There aren't a lot of trees but since we came in the spring, shade wasn't an issue. No picnic tables for those passing thru but it looked like residents have them in addition to their own little storage house. Would love to return with the grandchildren, however there isn't any playground equipment, although they could ride their bikes. Pool looked very nice, as did the clubhouse. No individual fire pits but there is one large community pit. This location is great for outdoor activities. If you are "attached" to your phone, you may have to put it away because the wi-fi is almost non-existent, very spotty and hard to maintain a connection, if you're able to get on what's provided by the campground. I called my carrier when I got home and they told me they don't have towers in that area. So you may want to check with your carrier or review their coverage map to confirm service before arriving. Will return again in the future. We stayed 4 nights here in August/16. It's very quiet and well maintained. The clubhouse has a mens and womens bathroom with two showers each and laundry but it's only open from 8-8. We fished off the docks and also used the boat access. The pool was clean and refreshing. Overall if your looking for a nice peacefull and quiet park on a nice lake, this is it. Lots are for sale but no pressure at all or sales pitches. Just returned from a 3 night stay at this resort. Overall we had a good experience. Great pads, moderate size pool, nice clubhouse with clean restrooms and shower facilities. The only drawback to the shower facilities is that since they are part of the clubhouse, access is not available until 8:00 am. Great lakeview, pristine landscape and secured gated entry. A few items that were lacking that would have made our experience a little better would have been some trees for shading (there are NO trees on this campground) a picnic table (none of the rentable lots have them, I think that residents are provided with an additional concrete pad with table and chairs (don't quote me on that), but I did notice that other campers around us did not have a picnic table either. A playground would have been nice but our daughter certainly enjoyed the pool. Another feature that was not available were individual fire pits. They do have a community fire pit but that makes it hard to grill burgers and dogs unless your camper is really close by. Staff was very nice and accommodating, they were willing to allow us to have a late check out. This is a pristine park with lots of room, big sites with concrete pads and a great view of the lake. Only drawback is typical slow wifi and no cable and limited over the air channels. We thoroughly enjoyed our stay and will come back. Love this place! Would highly recommend!